There have been many takes on the Apocalypse and equally as many on the post-Apocalypse. Quite frankly, I'm getting tired of it. How many times can I run across a barren wasteland, shoot zombies, or scavenge for items? Good thing the folks at Insomniac Games feel the same way, despite having their own Resistance version of the end times. 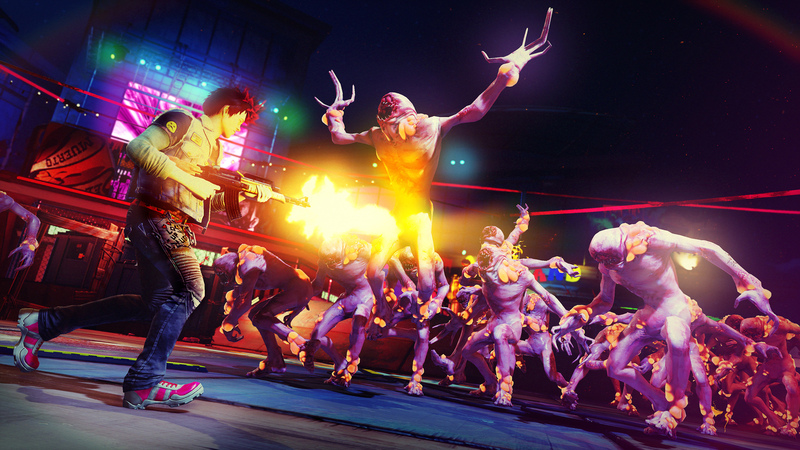 What they've done in Sunset Overdrive with its "Awesomepocalypse" is surprisingly refreshing. I went to the Insomniac Games office in Burbank, CA and met with Creative Director Marcus Smith and Game Director Drew Murray. They showed me an extensive demo of the Xbox One exclusive and even let me try my hand in the open world of Sunset City. The year is 2027 and the end has come for its citizens. An evil overlord company by the name of Fizzco has taken over the city. Their popular energy drink Overcharge Delirium XT has turned everyone that drank it into mutants called OD'D. For your hero though, this isn't a bad thing. It's the best thing that ever happened to you. 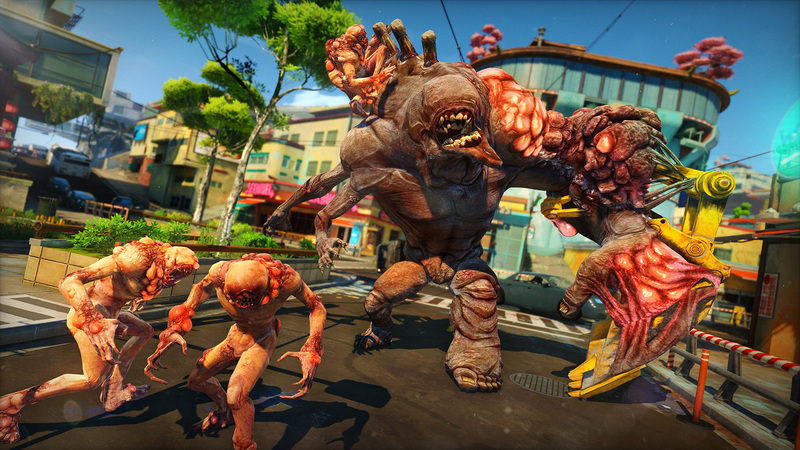 Murray posed the question, "What would you do if society were gone? What would happen if social laws were gone? Would it be Lord of the Flies or Burning Man?" 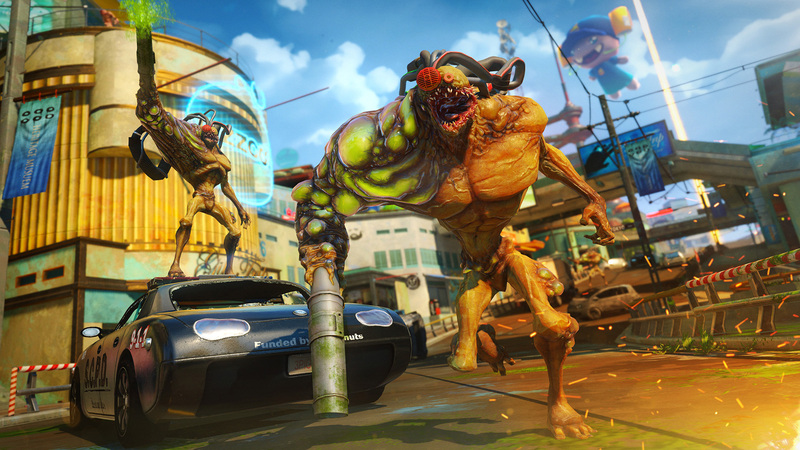 "We wanted to have the Apocalypse, but turn it on it's head and have it fun in the end times." Smith explained, "The way that we wanted to present that was have a very colorful world, have a place that you want to experience, and want to walk around and look around every corner. So the art style mimics the music and everything else in it is high energy, high excitement, fast action..."
"...and NOT DARK!" chimed in Murray. "That was our first rule after working on Resistance was 'No Rubble' and the second rule was 'No Gray.'" Instead of having to figure out how to survive, you are living it up! You don't have a job or a boss to answer to. You can wear whatever you want, go wherever you want, and pretty much do whatever you want. 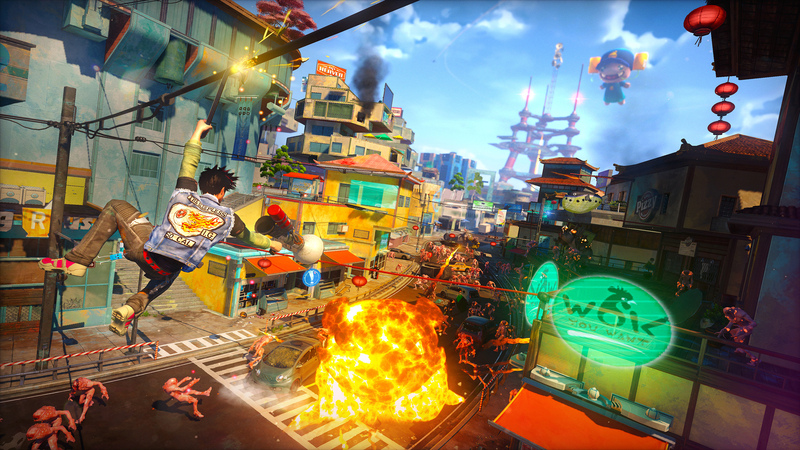 The city is designed to be an amusement park of sorts, with crazy weapons, wacky outfits, and a slick traversal system. 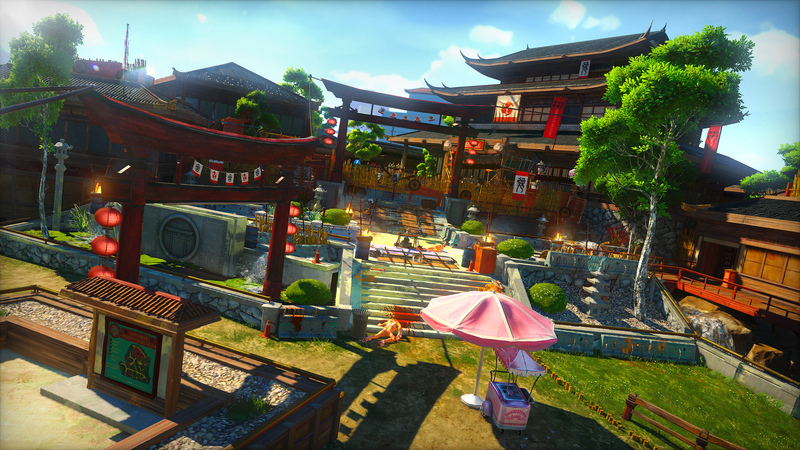 "One of the things that sets us apart from other games is we are really trying to keep the traversal grounded. It very much has to do with the player interacting with the environment. It is much more akin to Tony Hawk with guns than maybe Infamous or Assassin's Creed," explained Murray. Moving around Sunset City consisted of pull swings, wall running, and lots of rail slides on a variety of surfaces like power lines, edges of buildings, and railings. If you've never been a big skateboarding fan such as myself, don't worry! It was simple to pick up and felt really natural, even jumping from surface to surface. Engaging with enemies while sliding also had a nice, snappy feeling when changing directions. 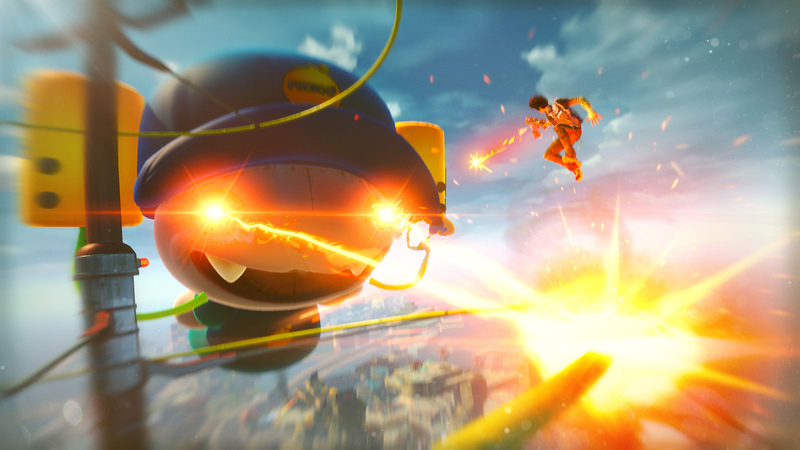 You can even flip into a zip line-like motion to transfer under the power lines instead of on top of them. But we won't see vehicles in Sunset City because according to Smith, "We are building off the idea that this isn't a cover shooter. We don't want people cowering behind cover...We want to get people out and about and interacting, so that's not just a way to get around the city but how to interact with everything." Moving around the city fills your Style Meter. The higher your Style level, the more amped up your abilities are and the stronger your weapons become. There is a Style level skill tree that you can upgrade which unlocks abilities called Amps. 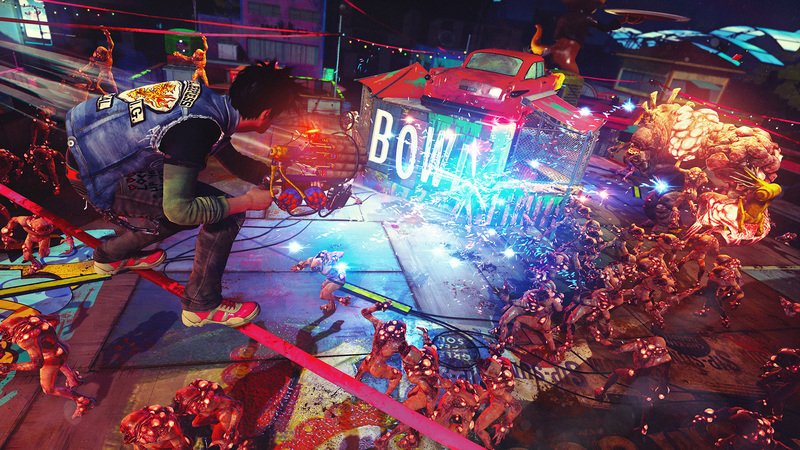 There are different categories of Amps coming in a variety of flavors, like the Direct Shock which sends a line of electricity out when you jump into a melee attack or the Twist of Fate which detonates a nuclear-type explosion as seen in their E3 trailer. 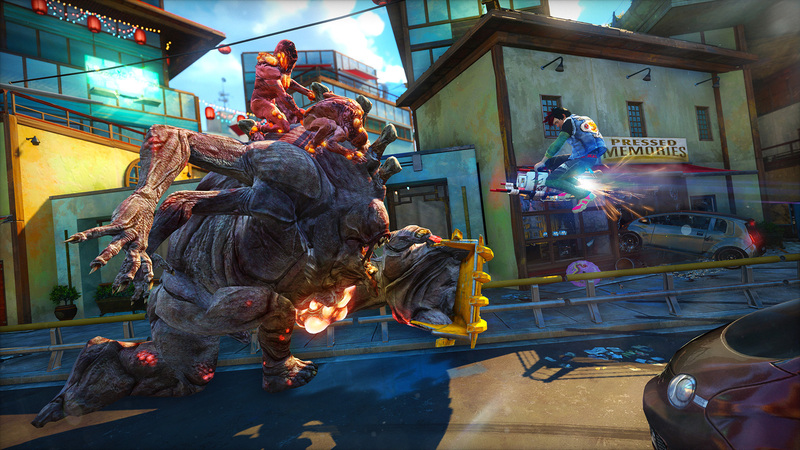 Expect lots wacky weapons with a funny twist in Sunset Overdrive, as it is one of Insomniac's calling cards. For example, The High Fidelity shoots 12-inch records, the Roman Candle shoots fireworks, and the Captain Ahab shoots harpoons with Overcharge which allows you to attract OD'D. Though you'll primarily be taking down the variety of mutant types, there are also other enemies in the game such as the robotic Fizzco Security as well as other humans called Scabs. There is also a crafting system which they weren't going into detail about yet, but they did tell me about their extensive customization options for your hero. You can choose to be male or female and then pick your body type, race, and deck yourself out with an extensive costume selection. 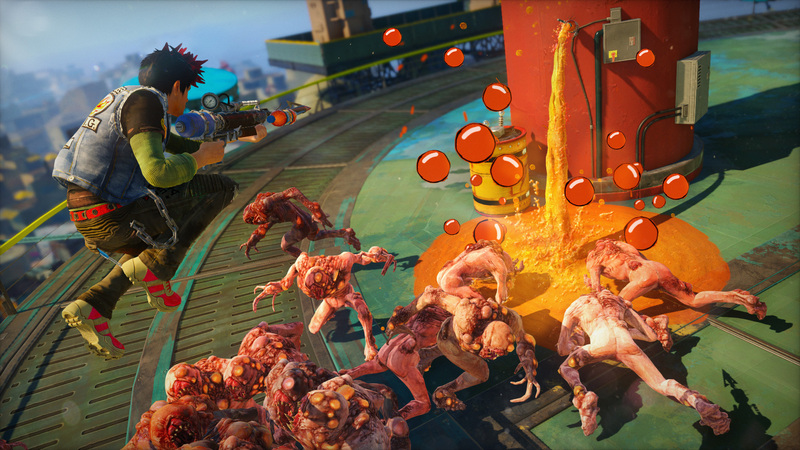 I'll admit the cartoonish nature of the world had me a bit turned off at first, and certainly the idea of another zombie shooter bored me. But this game is aiming to do something different by challenging players to ask themselves, "What would you do in your Awesomepocalypse?" I certainly never thought about the end times as being a fun place to be, but maybe it could be? 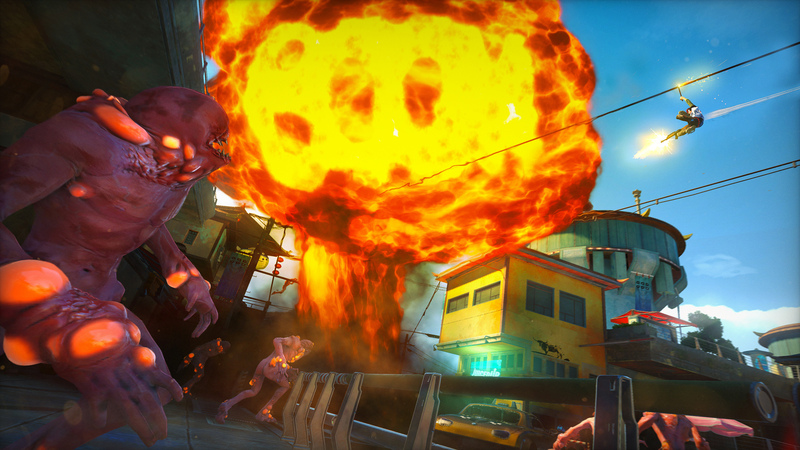 We can expect to see more from Sunset Overdrive at E3 in June as they'll be on stage during the Xbox Press Conference. But if you want to learn more about Sunset City and get a first look gameplay, watch my video interview with Murray and Smith debuting on May 13th.